At InteRACT, you'll work with speech-language pathologists and interns, recreation therapists and physiotherapists. Get helpful communications strategies and tips to help you communicate with someone with aphasia. See some inspiring stories about how people with aphasia have overcome the odds. InteRACT is a 4.5-week intensive aphasia treatmeent program for adults with aphasia. The aphasia treatment program combines one-on-one therapy, small group sessions, recreation therapy, physiotherapy, computer skills development and community outings to help you get the skills and strategies you need to return to the activities you love. Our innovative approach to aphasia treatment will help improve your reading, writing, listening, speaking and social interaction skills. And by getting out into the real world and practicing your new skills and strategies, you’ll gain both the tools and the confidence to re-engage in the life you once knew. Explore our program details. You’ll work with speech-language pathologists, recreation therapists and physiotherapists. You’ll also work with bright and enthusiastic speech-language pathology interns who provide indispensable additional support. Meet our team. Our program is based on the principle of neuroplasticity—that the brain is a constantly evolving organ, affected by internal and external factors. Some changes in the brain, such as those caused by stroke or trauma, can result in aphasia. But even after the incident occurs, the brain continues to change. At InteRACT, we can impact those changes to your brain. By manipulating the environment through intensive therapy and training, we can help your recovery. Founded in 1818, Dalhousie University welcomes over 16,000 students each year. The university is known for excellence in many areas, including law, business and health sciences. InteRACT operates out of the Sir Charles Tupper Medical Building, the heart of the university’s Medical School. Being on campus is inspiring—and ensures our team is always up on the latest research and techniques. 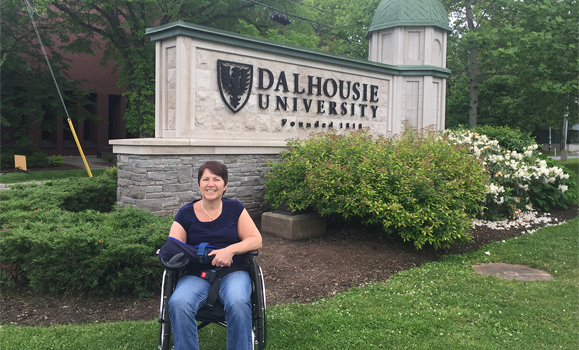 We regularly consult with faculty at Dalhousie’s School of Communication Sciences and Disorders, the Department of Psychology and Neuroscience and other departments and schools in the Faculty of Health. Halifax is a beautiful and vibrant seaside capital. It’s a popular tourist destination, boasting deep history, spectacular parks and gardens, and music, culture and art for every taste. As a city of over 400,000, it also has all the amenities and services you may require. Learn more about Halifax.